A scene featuring characters of the Playstation 2/Wii game, Okami. Wallpaper includes Amaterasu with brush gods Bakugami(pigs), Hanagami(monkey), and Tachigami(mice). 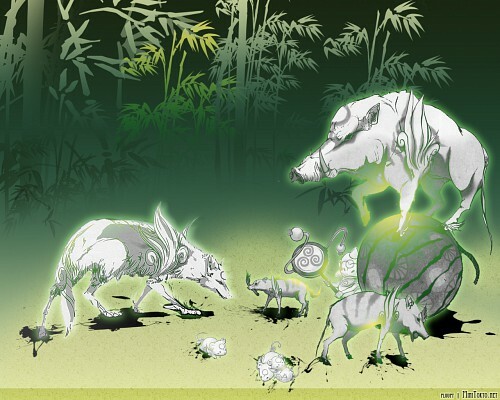 The new chibi gods are from the game Okamiden for the Nintendo DS. Will be working on other resolutions upon request only. wow ! i like this wall! is so pretty! the green color is so amazing on this wall! very very good work!